This Vital Issues Series is being produced by Bibliotheca Sacra, of which Zuck is the editor, and published by Kregel. 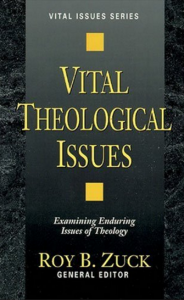 This volume on theological issues proved to be well worth the investment. Many of the articles are new such as Prayer and the Sovereignty of God by John Hannah, The Doctrine of Conscience by Zuck and Untold Billions: Are They Really Lost? by J. Ronald Blue. Others are classic reprints such as L.S. Chafer’s The Terms of Salvation and Alva J. McClain’s The Mediatorial Kingdomfrom the Acts Period to the Eternal State. Thomas G. Lewellen’s Has Lordship Salvation Been Taught Throughout Church History is a must for those dealing with the Lordship issue.